Starting today, each entry on the new Hot List will qualify for our “Hot List Special” processing. With this service, you will receive One Day processing at the One Week price. That is $0.50 per raw trading card and $0.75 per graded, encased, or jumbo card. Hot Theme: 2013 Football Products. The NFL draft begins Thursday April 25 (8 p.m. 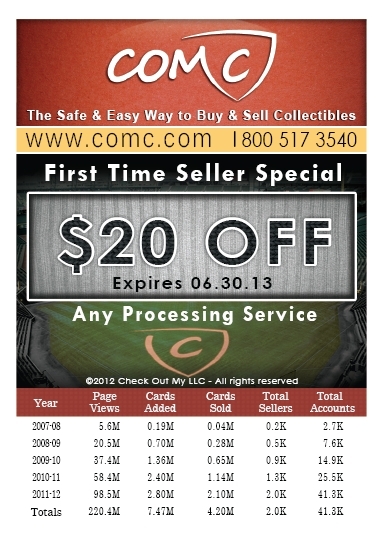 ET), and to celebrate we’re accepting all 2013 football products as eligible for Hot List processing! Thanks for your input for this new Hot List, and watch our Facebook page for the call for suggestions for the next Hot List in a week! ← Scheduled Steve Hollander sighting! 90-91 Pro-Set. People can’t get enough of the stuff! Just sold a 1991 Pro Set Tom Kite for 45 cents! My idea for the Hot List Special. I like this idea as well! I collect a older player that doesn’t really have any new cards since 2009 (so he most likely will never be on the “hot list” or hot list brands. He also most times doesn’t bring big money so people are not so quick to send in his cards, because the return might not be there. But it would if you ran a deal on the slower level. And its already hard for me to find cards of him that I still need. I would put a wanted add, but I don’t want people adding them and then jacking up the price just because I might need it (has happened to me many times). I like the hot list thing, and its great on a nice mid-higher end stuff, but on cheaper cards its not a great deal, because if you are sending $1 cards its kinda hard to pay $.50 just to have them added faster. I know a lot of people don’t think that those cheap cards sell, but they do! This is pretty much the only place I know where you can buy a cheaper common you need and not spend $5 ($3-$4 of that being shipping). If I was selling, I would rather sell 1,000 $1 cards, then 1 $500 card! So the point is its not always about the higher end cards. And whats up with everyone wanting the newest of everything and everyone. Don’t people know about 90% of those players will be bust-ok players in a few years. Another topic lol. Run some deals on the cheap o’s!! And maybe a deal on shipping! And make sure it applies to cards from the old site that are sitting in accounts! Side note do you guys still do the first time seller coupons? I am starting to get the itch to send in some stuff. Just print it out and include it in your shipment. t-cert football, playbook football. I missed the train last time. o and 2011 Gold Standard and 2012 Topps Triple Threads Football that is.